New serviced apartment property the Rosebery has opened in central London. 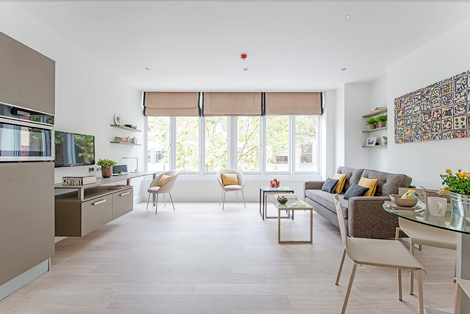 Located on Rosebery Avenue in Clerkenwell, the complex has 58 apartments and is the third property from London serviced apartment company Supercity. The apartments are a mixture of studios, one-bedroom and two-bedroom units, with “premier” apartments available in each category. They are modern and sleek in design with features such as free wifi, fully equipped kitchens, king-size beds, flatscreen TVs, iPod docks, safes, air conditioning and a secure entry system. Some apartments have views of landmarks such as St Paul’s Cathedral, the Shard and the Gherkin. Reception is manned 24 hours and there is a ground-floor bar serving food from 10am to 10pm. Guests can also avail of a weekly maid service (or more frequently by agreement), a dry cleaning service, and discounts at local restaurants (Moro, Caravan and Strada). The minimum stay is seven nights and rates start from £130 per night plus VAT, with lower prices for stays of more than 28 nights. Supercity’s two other properties are in Earls Court. For more information visit supercityuk.com.